Anyone who has ever walked the dunes of the outer banks has seen them. 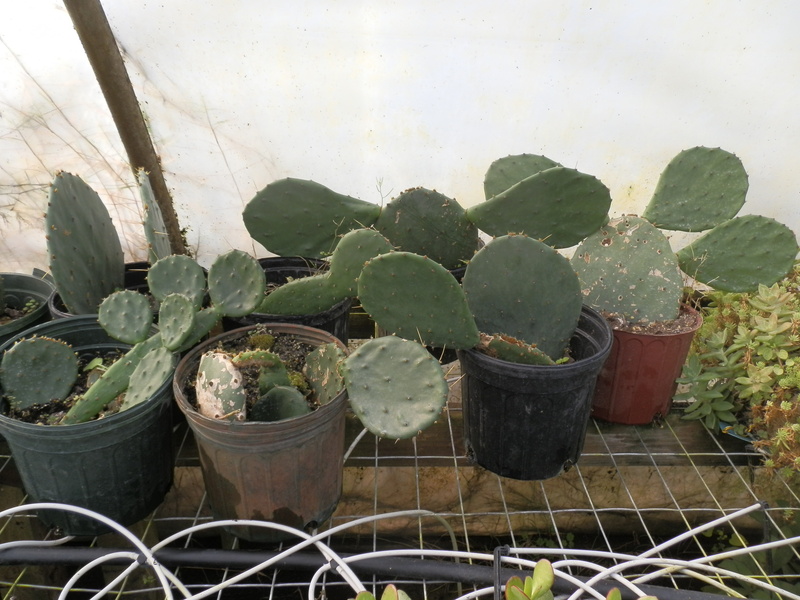 Prickly pear cacti (Optuntia sp. and Nopalea sp.) are something you definitely want to notice. I remember over 25 years ago when my oldest son came running to me with an ankle full of spines with leaves still attached. He wasn’t impressed. These cacti can make a great addition to landscaping. Some people like to design plantings that require little irrigation. We call this xeriscaping. With a little imagination yuccas, agave, sedums, certain types of grasses and various cacti can make an interesting landscape. 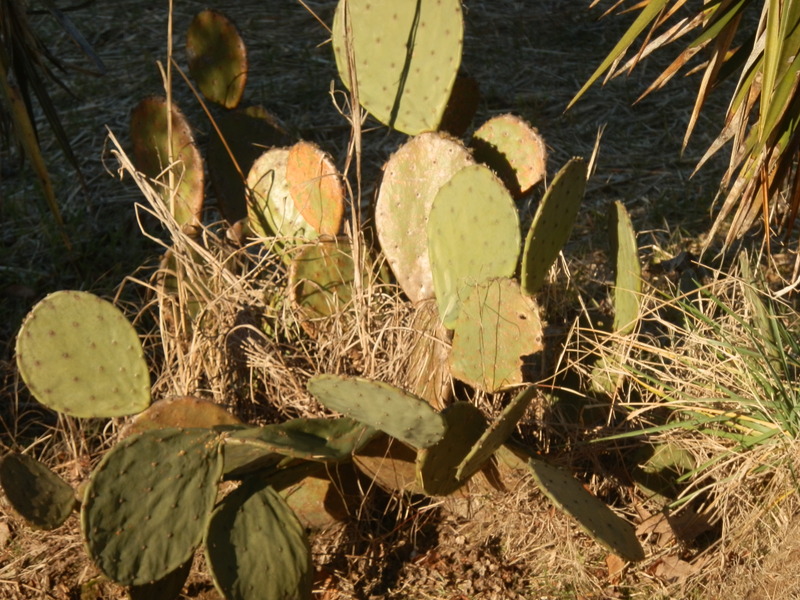 Prickly pears are common in dry places. We normally see plenty at the beach, but they may congregate any droughty area. Isolated patches can be found in almost every state and parts of Canada. There are numerous species which vary greatly in size, growth habit and prickly armor. Most of the eastern types have yellow flowers, but some from the desert southwest can be pink, orange or red. Many ornamental types have spread to the wild. The flowers are exquisite but many don’t know these desert type plants are edible. Both leaves and fruits can be eaten, but it takes a little care and patience to prepare them. It’s easy to notice the big spines, but the ones that can be especially irritating are the little ones. These hair-like spines are called glochids. They resemble potato eyes and can detach from the leaves with little effort. From there, they can work their way into your skin in a hurry. Preparing leaves for the table involves removing any large spines and scraping the skin surface of smaller ones. One loosened hit the leaf pieces with a blast of water. Brush and rinse them again just to make sure. They remind me somewhat of okra, since they contain sticky mucilage. Use them like you would okra or surf the web for some great Mexican recipes. The fruits are the pear-shaped structures beneath where the blossoms were. They contain several crunchy seeds in a gelatinous media much like tomatoes. Color varies, but when ripe these berries are usually some shade of pink. Cleaning them is every bit as tedious as preparing the leaves. Tiny glochids are the biggest headache. Flavor of the fruits resembles raspberries, though it’s not quite as strong. Prickly pears are great raw or cooked. Just a few can add interest to a fruit salad. Sweeten them and simmer the pulp into a sauce to serve over ice cream. That’s nice too. Many sources claim health benefits from eating leaf pads and fruits of the prickly pear. They contain chemicals called flavonoids that can reduce inflammation. Consuming prickly pear cactus can also lower blood sugar levels. Diabetics should monitor their blood sugar carefully if consuming moderate amounts of prickly pear. Check with your doctor about adjusting medication. Abnormally low glucose levels aren’t desirable either. Anyone on prescription medication should consult a medical professional when taking any herbal extracts. It’s not wise to self-medicate, but don’t be scared of new things. This entry was posted in foraging and tagged edible, edible foliage, edible fruit, flavinoids, glochids, lower blood glucose, potato eyes, prickly pear cactus, raw or cooked, spines, xeriscaping. Bookmark the permalink.